For a breakfast treat that's as easy as 1-2-3, simply layer fresh sliced strawberries with vanilla yogurt and your favorite granola. 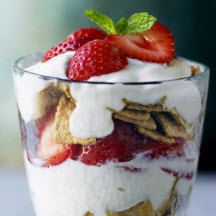 For each parfait, place 1/4 cup strawberries in bottom of parfait glass. Top with 1/4 cup yogurt; sprinkle with 2 tablespoons granola. Repeat layers. Serve immediately. Nutritional Information Per Serving (1/4 of recipe): Calories: 312; Calories From Fat: 10; Total Fat: 4g; Cholesterol: 2mg; Total Carbs: 65g; Fiber: 4g; Protein: 9g; Sodium: 69mg. Recipe and photograph courtesy of California Strawberry Commission. Used with permission.